Magnesia (Greek: Μαγνησία, Magnisía, [maɣniˈsia]), deriving from the tribe name Magnetes, is one of the regional units of Greece. It is part of the region of Thessaly. Its capital is the city of Volos. 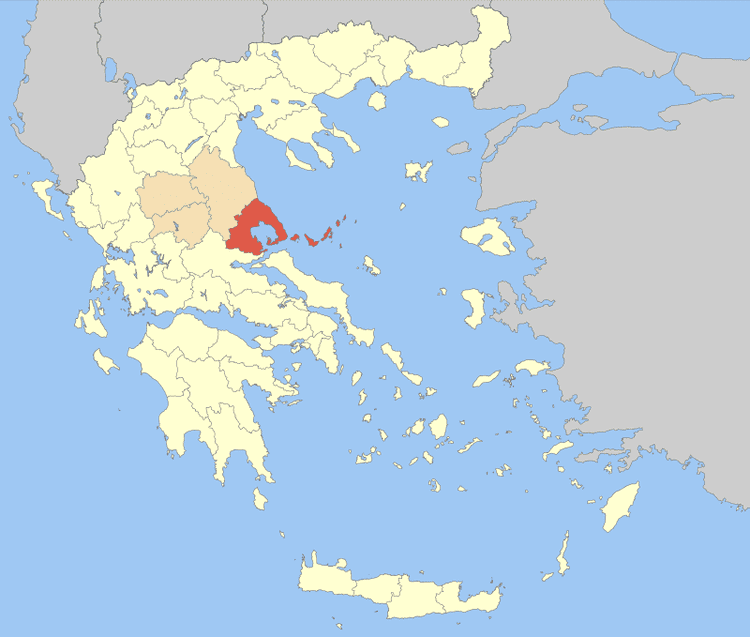 About 70% of the population of Magnesia live in the Greater Volos area, which is the second-largest city in Thessaly and the third busiest commercial port in Greece. According to the most recent census (2011), the population stands at 190,010. The regional unit hosts 2,000,000 tourists annually. Magnesia is represented in the Greek Parliament by five seats. Its main agricultural products are wheat, cotton, tomatoes, grapes, olives, apples and honey. According to Hesiod's (probably) "Eoiae" (Greek: Ηοίαι) or "Catalogue of Women" on the origin of the Greeks, Pandora (named after her grandmother Pandora, sister of Hellen and daughter of Deukalion and Pyrrha) together with Zeus had one son Graecus, while Zeus had two more with Thyia, another of Deukalion's daughter: Magnes and Macedon. Magnes and Makednos together with Hellen's three sons Dorus, Xuthus (with his sons Ion and Achaeus) and Aeolos, comprised the set of progenitors of the ancient tribes that formed the Greek/Hellenic nation. Magnes ruled the area and people under his name. Magnesia is also homeland of the mythical heroes Jason, Peleus and his son Achilles. The word magnet comes from the Greek "magnítis líthos" (μαγνήτης λίθος), which means "magnesian stone". The names for the elements magnesium and manganese are also derived from this region, which in addition to the magnetic magnetite (an iron ore), produces certain ores of magnesium and manganese that were known to alchemists. The Magnetes contributed to the Greek colonization, with their main colonies being established before the 7th century BC, under the names of Magnesia beside Sipylus in Lydia and Magnesia on the Maeander in Ionia. In the area of Pelion are the monastery of Saint Yerasimos in Makrinitsa, The Holy Archangels in Agios Georgios Nilias, Osios Lavredios in Agios Lavrendis, Saint John the Baptist in Siki and Saint Spiridon in Promiri. The most famous is the Monastery in Flamouri, built in the 16th century by Osios Simeon, the so-called "barefoot and loin-clothed", located above Veneto. In the Almiros area and on the mountain of Othris two other monasteries were built, one inhabited by monks in Ano Pagania (Virgin Mary) Xenia and the other by nuns in Kato Panagia Xenia. This monastery holds historical monuments of the area from the 12th century, with of frescoes, treasuries and a library. In Kato Panagia Xenia monastery, an icon of the Virgin Mary, venerated by the people of the area, is kept. All the monasteries are of archeological, historical and artistic interest and are accessible (the one in Flamouri only by men). The prefecture was linked to the National railway (ΟΣΕ) in the late-19th century. In 1964, the GR-1 North-South superhighway was opened to traffic. The prefecture is directly linked to the rest of Europe through International Airport of Central Greece, located in Nea Anchialos, a short distance from Volos. The airport includes a terminal which can serve 1500 passengers per hour.